Actor-writer Simon Callow has published books on larger-than-life figures Oscar Wilde, Charles Laughton, and Orson Welles. It is only logical that he would be drawn to the most controversial composer and grandest ego of 19th century Europe, Richard Wagner. 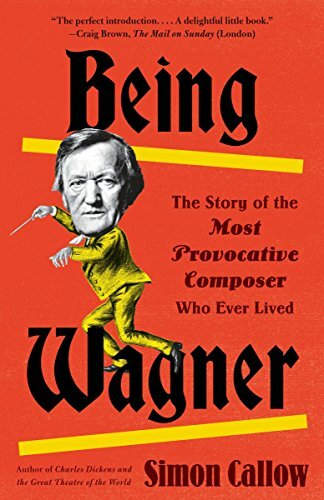 In his fascinating, energetically written book, Being Wagner, Callow does not offer detailed analysis of Wagner’s operas. Instead, he focuses on Wagner the man and his place in 19th century German society. Callow revels in the paradoxes that define Wagner’s life and work. He had no university education and little formal musical training but wrote his massive libretti, which were set to music that changed the way future composers and audiences thought about music. He was a short, homely man whose head was disproportionately large and who had a terrible skin condition but was notorious for his romantic life. Equal to the genius was the ego. Wagner saw himself as the man who would redefine German music and opera at the moment when Germany was becoming one nation. He had a virulent hatred of foreign influences, expressed most vividly in his passionate anti-Semitism. Though Wagner, banned from Germany for years because of his revolutionary activities, would have hated Hitler’s politics, it is no wonder that Hitler was a passionate Wagnerite. Wagner was also intent on reforming operatic practice. Born into a theatrical family, he wanted to produce opera in which all theatrical elements cohered. To do that, he discarded all the artificial conventions of 19th century opera: the florid singing of Italian bel canto opera, the fixed structure of arias, duets and ensembles; the often unnecessary chorus and the always tangential ballet. He would write coherent music dramas that were as much drama as music. Callow is good at discussing Wagner’s links to German philosophy, particularly the crucial influence of Arthur Schopenhauer and the composer’s turbulent relationship with Friedrich Nietzsche. Callow points out how Wagner treated his philosopher acolyte as a lackey and how Nietzsche’s obsession with Wagner turned from worship to fierce emnity. Wagner’s financial situation is an essential part of Callow’s story. Wagner believed that wealthy men should support his genius. Few agreed with his assumption, and the composer spent much of his life hiding from creditors. Then he met the teenage King Ludwig of Bavaria who was obsessed with Wagner’s music and besotted with the man. Ludwig supported Wagner handsomely for many years and was devastated when the composer died. Callow claims that Ludwig was one of the few people to whom Wagner was personally devoted. Then there are the women: the long-suffering first wife, Minne: the muse, Mathilde Wesendonck; and, finally, Cosima Lizst von Bulow, the young daughter of his friend, Franz Lizst and wife of his conductor, Hans von Bulow. Cosima was another ardent disciple—Wagner was most attracted to people who worshipped him. Finally, the capstone of Wagner’s dream: a theatre in Bayreuth totally devoted to his work and built to his specifications. Callow makes the long gestation of the Festspielhaus fascinating reading. Throughout Being Wagner, Callow displays his gifts as a storyteller. Being Wagner began as a one-man show and the reader always feels like he is in the hands of a superb performer. The style is conversational, but the book is based on an enormous amount of research. Being Wagner is an excellent place to begin a study of this troublesome genius.